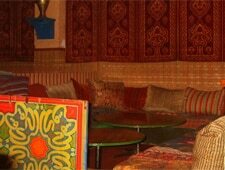 THIS RESTAURANT IS CHANGING LOCATIONS Moroccan cuisine and exotic entertainment make this a must-go dining experience. : THIS RESTAURANT IS CHANGING LOCATIONS The dining experience at Marrakesh may be one of Washington's biggest surprises to those not forewarned. Although food is abundant, the focus is more on soaking up the exotic atmosphere and applauding the talented belly dancer than eating. You'll leave this sumptuous place in a state of sensory overload. The ambience --- colorful tiles, splashing fountain, lush carpets, painted ceiling, pulsating music and general ebullience --- probably will inspire your wanderlust for distant ports. There's no written menu, and as the server washes your hands in a stylish ceremony, you may hear that you'll feast on the following courses: salad (carrots, tomatoes, cucumbers and eggplant) with bread, b’stilla (Moroccan meat-filled pastry), half a roast chicken with lemon sauce, lamb with honey and almonds, couscous with steamed vegetables, fruits, and at the end, minted tea with honey-soaked baklava.